Our South Lyon center, located on Lafayette St., opened up in October of 2016 in the heart of Downtown South Lyon, and is easily accessible to everyone in the community. PPTS South Lyon is proud to be partnered with South Lyon High School to provide injury assessment and care for all athletes, on and off the field. PPTS South Lyon Center is also our only location that provides Aquatic Therapy. 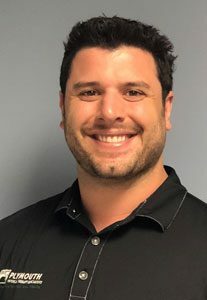 Michael Forgach, PT, DPT, OCS, joined the PPTS team in 2015 after graduating from Michigan State in 2009 with a Bachelor’s Degree in Kinesiology and receiving his Doctorate of Physical Therapy from Wayne State University in 2014. Since joining the PPTS team, Mike has worked with a variety of patients, including post-surgical rehabilitation and those patients with complex orthopedic conditions. Mike has a passion for working with, treating, and educating athletes; whether they are just beginning, high school, collegiate or on a professional level. After working in Orthopedics and Sports Medicine through PPTS, Mike is now a board-certified Orthopedic Clinical Specialist (OCS). Mike hopes to continue his passion for physical fitness by incorporating and educating his patients throughout their treatment. Mike’s goal is to provide positive outcomes for his patients by teaching them the exercises, skills, and techniques to return to them to their functional goals.